Test Course: Approximately 70 miles of table-flat highway from Fresno CA to Los Banos CA. 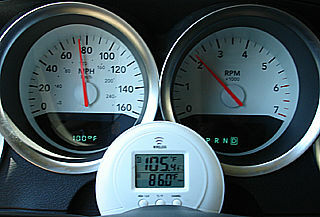 Test Conditions: 94-100 degree California summer heat (dry). 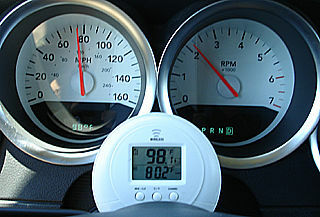 A $20 'wireless' thermometer purchased from OSH. 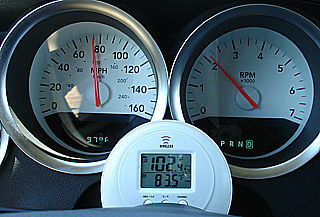 Wireless = a remote transmitter that is connected to a wired temp sensor and reports to a second unit, which in the accompanying pictures you can see sitting atop the steering column. The wire is long enough that the remote transmitter is actually sitting inside the car. 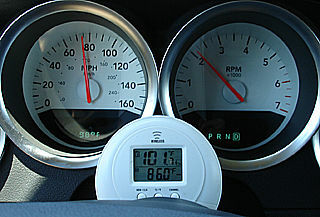 The unit has a metal element for fast detection of changes and a 30-second refresh rate. After running the first temp test on the top surface of the filter, the next steps were to test other positions on the filter to see if there was temperature variance. 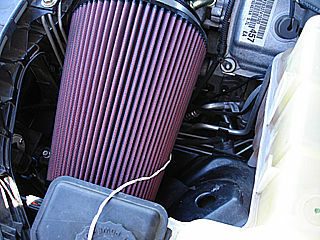 Of particular concern were the sides of the filter facing the engine now that the heat shield had been removed. 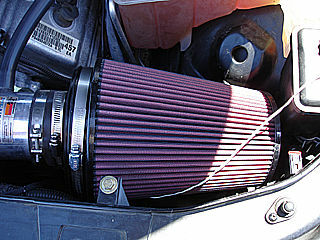 If you move the sensor to face the engine, is there radiant heat loading up the filter with hot air, or is the air circulation -- which has been strengthened as described -- now so stong that it partially or completely negates the obvious reality of a hot engine sitting right next to the air filter? 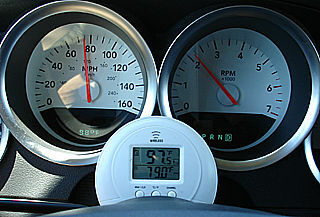 Started by placing the sensor at the 3 o'clock position, which directly faces the engine. This is not quite optimal to blast the hottest air we can onto the filter, but more on that below in the final filter test. Round 1 began with a hot engine, so lets do that again. Stopped on the side of the freeway onramp and let the running engine bake itself, which takes about two to three minutes. What you can't see from the pictures is how fast the heat gets shucked. Its fast. 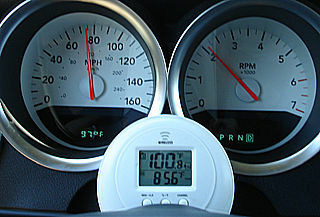 This pic was snapped on the first temp sample interval after I hit the freeway (just after the last one). 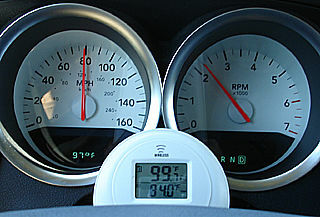 It is 100 degrees outside and the temp has dropped to five degrees above ambient. At the moment I have the A/C on. Cruise control is at 75. Remember... the sensor is now facing towards the hot engine. 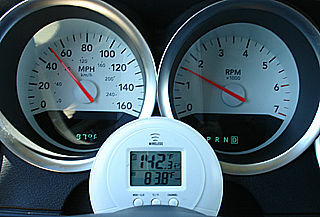 From a five degree variance over ambient, the temp settles at three degrees and stays there. 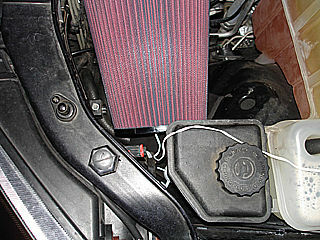 As the temp drops outside the engine bay temp drops right with it. 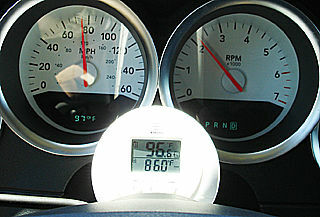 In the last shot, which shows an approximate two-degree variance, note the cabin temp of 94. I have the AC off. Anything for science. So... if me move the sensor to more or less face the hot engine... the difference is less than the average five degree variance we saw in the top-of-filter test (and its hotter today than it was in Round 1). Why did it get cooler if we were facing a hot engine? The amount of air circulation is so great it overcomes the engine heat when at any sort of speed (the 40mph steady-speed tests in Round 1 bear this out, as do the very high speed runs which show temp going down hard).Time for the next test. Lets move the sensor to the 9 o'clock position where it is facing straight front. Even though the front end is sealed, did unsealing it way down low let air all the way up top and in front? If you look (and you don't have the stock airbox in place to obstruct your view), you'll see the body panel that has the hole for the silencer does not seal to the front and there is a gap where air could circulate up. Next we bake the engine on the offramp so we are starting out the same as last time. I had actually started rolling at 137 degrees but by the time I was at the bottom of the ramp I was at full temp. Set the cruise at 75 and by the time the very next temp sampling takes place temp has shot down to five degrees above ambient. ... and then drops to two degrees. Then to one. Then it holds dead-on at ambient. I'll skip the in-between pics and just show you where it settled. But it held here solidly for a few miles. 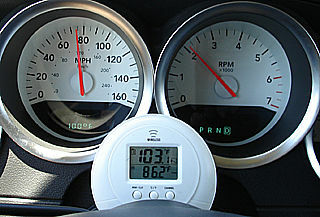 The LX thermometer rounds temp off and the external one does not. 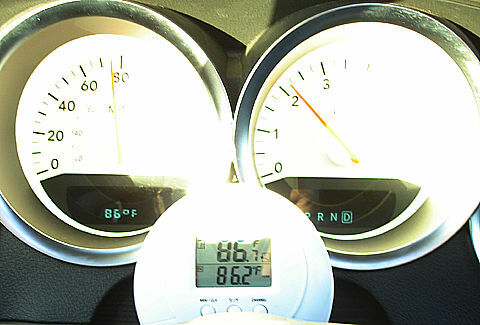 So when the car says temp is '98' it could really be 97.5 rounded up.So that test is done. Air coming into the front of the filter is flat-out ambient.Next its time for what is either going to measure cool air ... or the hottest of all. I needed to test the bottom feed, which is faced directly by a vent that leads to ambient air (the silencer hole). I decided instead to put the air sensor at 5 instead of 6 o'clock to try and eat up some heat from the lower part of the engine block. All I've found is cool air so far so I was more interested in looking for the hot stuff than proving that the bottom feed was ambient. I thought this one was going to be the hottest of them all. Just having my hand in the engine bay setting the sensor into place I could feel a LOT of heat. 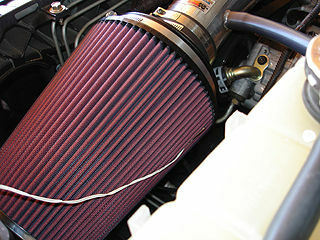 But engine heat is no match for air flow. if you get the car moving the heat is dissipated. Last Round, on the day following Rounds 2-4: Put the sensor inside of the filter material at the very end of the filter, which holds a 'power stack' air inlet (not visible in pictures). Thanks to the angle of the sun, most of the pictures didn't come out, but they all showed the same thing: Absolutely ambient air going into the filter, essentially at all times. 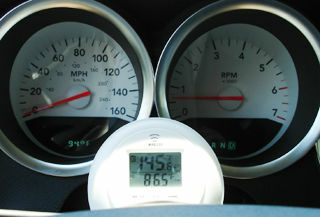 Note this picture shows the same air temperature in the engine compartment, filter media and interior cabin - I had the windows open.